Headstones Gisborne .... and World Wide! you are only limited by your imagination"
"Granite = Beautiful, Timeless & Lasting Memorials"
When choosing a memorial for your loved one we understand how important it is to get it right so we are here to help guide you and make this as stress free as possible. 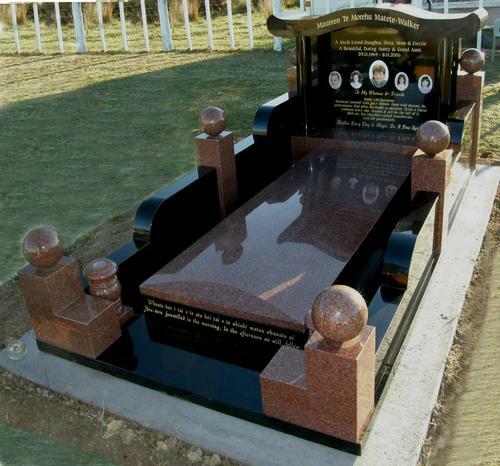 Our products are manufactured from solid granite blocks, although you are not limited to granite for a memorial for your loved one. Some other products we deal with are natural and local stone, bronze and aluminium chromed plaques. Hinuera and Omaru stone, Alphine rock to name just a few. If you have an old memorial that needs some TLC, refurbishment requirements or you are after a new memorial for your loved one we are here to help and make your job as easy and stress free as possible. BRING US YOUR WISHES AND IDEAS AND WE'LL CREATE A MEMORIAL YOU WILL BE PROUD OF!